Keeping knives and cutters sharp is an essential task on the to-do list of a chef on a daily basis. A blunt blade requires more effort while slicing through food, especially meat, while a sharpened knife cuts through easily without slippage. Furthermore, nowadays, it’s not only about perfection in taste. Instead, you also consume food through your eyes. How would poorly chopped vegetables and meat chunks look on your serving plate? I’d lose my appetite if somebody served me that, for sure! 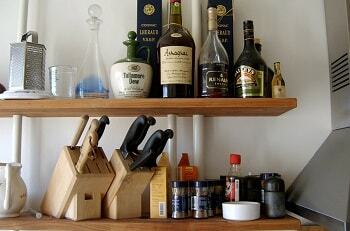 Thus, a proper knife sharpener is an essential tool in everyone’s kitchen. We’ve included the high-quality 2-stage knife sharpeners under $50 from Chef’s Choice in this review. It’s all about Quality and Reliability. 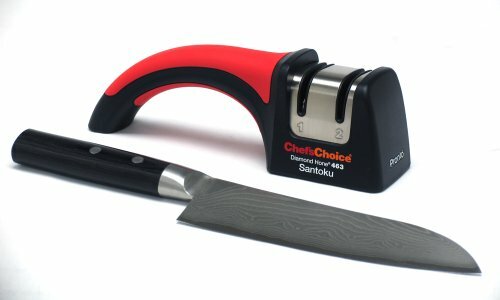 Chef’s Choice has been in the market long enough and is still maintaining a high reputation in the knife sharpener business. We have specifically compiled a Chef’s Choice top 10 list. Chef’s Choice knife sharpener review will list out the key features and specs of their popular models. The first and foremost feature to look for when buying a knife sharpener is its ability to produce a smooth edge while causing no real damage to the blade of the knife. Different knife sharpeners can be tried and tested to see which one suits your choice of knives. Frankly, not everyone would spend the hard-earned money to test the qualities of different brands in the market. The most economical way is to read the online reviews to find out the pros and cons of your preferred sharpener and decide which to buy. Side note: The America’s Test Kitchen had performed a quality test on different brands and recommended the Chef’s Choice 15 Trizor XV as the best electric knife sharpener. However, the Trizor XV is a high-end sharpener not everyone is willing to invest money in it. But if you put in some time to read the reviews on cheaper models, you’ll hit the jackpot. Stay tuned. The second most important feature is the abrasives of the sharpener. 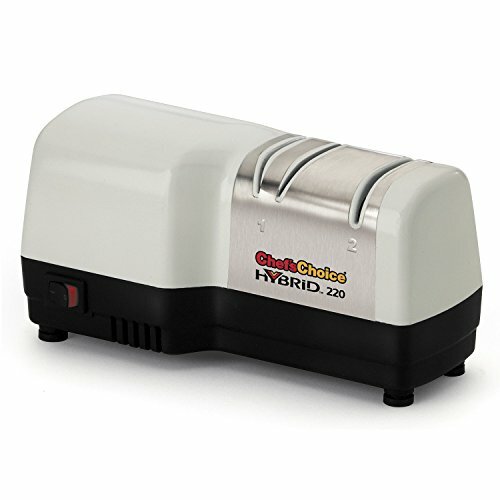 Popular sharpeners are available in diamond, polished ceramic, and tungsten carbide materials. Among all, diamond is the most popular and the best performance abrasive in sharpeners. Diamond is the hardest material in the world and when it’s use to grind metal, it’ll ensure a smooth blade finishing. Sharpeners that equipped with well-designed angle guides provide the best sharpening results. The structure will ensure smooth and even sharpness on the entire edge during the sharpening process. No guesswork on your side. The angle guides will hold the blade such that it yields the optimal result every time. 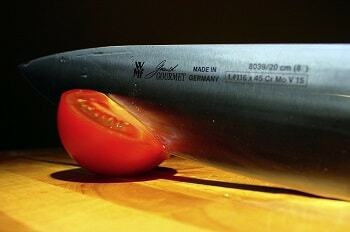 For European knives, a 20-degree angle is recommended, but for Asian knives, the angle should be about 15 degrees. Safety is vital when it comes to choosing a knife sharpener. If a sharpener overlooks potential safety features, it’s a big no! Nothing compares to safety first. Slip-resistant rubber feet are used to firmly place the sharpener on the countertop for sharpening the knives. Slippery feet must be avoided under all circumstances to prevent mishaps. There must also always be a barrier between the blade and your fingers. Look for this barrier when choosing a knife sharpener. This two-stage hybrid sharpener made from brushed stainless steel has to be the ultimate choice for chefs and home cooks who enjoy a knife sharpening experience with the help of a cutting-edge tool. The electric sharpener is to be used for sharpening, while the manual sharpener has been put in place for honing. Can be easily used on straight and serrated knives. Comes equipped with diamond abrasive wheels that can be used for both sharpening and honing. Its new Criss Cross technology enables sharp edges with a substantial “bite”. With the help of the diamond abrasive wheels, a burr-free edge may be obtained for the blade quickly. The diamond abrasive wheels in stage 2 make sure you get a super-sharp and polished edge on the blade. Can be used for kitchen knives, household knives, sports knives, and pocket knives. Recommended by Cook’s Illustrated, the Chef’s Choice Pronto 463 is a manual sharpener and it’s the fastest one in the market for kitchen knives. If you’re looking for a manual knife sharpener from the premium product options, the Chef’s Choice Pronto 463 Diamond Hone Sharpener is ranked the best among those available under $50. You can take home a quality product that guarantees optimal value for your money. This manual knife sharpener comes with 2-stage technology, where the first stage has been dedicated to sharpening the blade and the second one hones and polishes it. It enables an arch-shaped, razor-sharp edge that makes for a durable and sturdy blade that does not require sharpening in short spells. It comes equipped with 100-percent diamond abrasive wheels that are utilized in both stages. The diamond abrasive wheels have been manufactured to retain their sharpness for an indefinite period of time, unlike ceramic wheels that are short-lived. The diamond abrasive wheels use a sharpening method that provides a burr-free edge to your blade by smoothening it thoroughly. Powered by a Criss Cross technology that helps create a sharp edge with a lot of bites. The micron-sized diamond abrasives provide a super-sharp edge on the blade after stage 2. Its bevel angle perfectly grasps the Asian 15-degree edge and can be used to sharpen other double bevel Asian knives. This manual sharpener can be used on both straight and serrated blades. It can be used by either hand. The handle is soft to the touch, which ensures an easy and secure grip for all. The rubber body keeps the sharpener secured on the countertop firmly, keeping it from slipping. If you are on a shopping spree on a budget of $50 for buying kitchen essentials, these two knife sharpeners should not be missed. Keep your knives sharp with a smooth and clean blade. You will be ensuring that all essential safety features are met and that your cooking experience becomes more fun and exciting with these budget-friendly knife sharpeners. These 2-stage knife sharpeners under $50 will help keep your knives as sharp as new without breaking the bank.